If Your Seat is THAT STYLE with built-in suspension and have the follow model then these CUSHIONS are for you. NEW HI-TECH ARMS ALSO AVAILABLE, even if you have the old vinyl style. 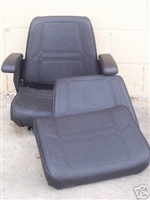 If you have the pan style seat then look in our ebay store.